"Slowing economy has resulted in as low as 30 per cent drop in hiring of freshers in 2012 and the trend continues in 2013 too, IT giants hired very less number of students in these years. To overcome this effect we at Accurate Institute have opened our gates to start-ups and Small and Medium Enterprises (SMEs)." There is one positive side too of this slowdown that, now the medium sized companies have started getting talent all across. This is the reason in last placement session (September 2012- April 2013) we could able to host a campus of as many as 186 companies and the legacy continues in the current session (September 2013- December 2013) we have organized 180 campuses. 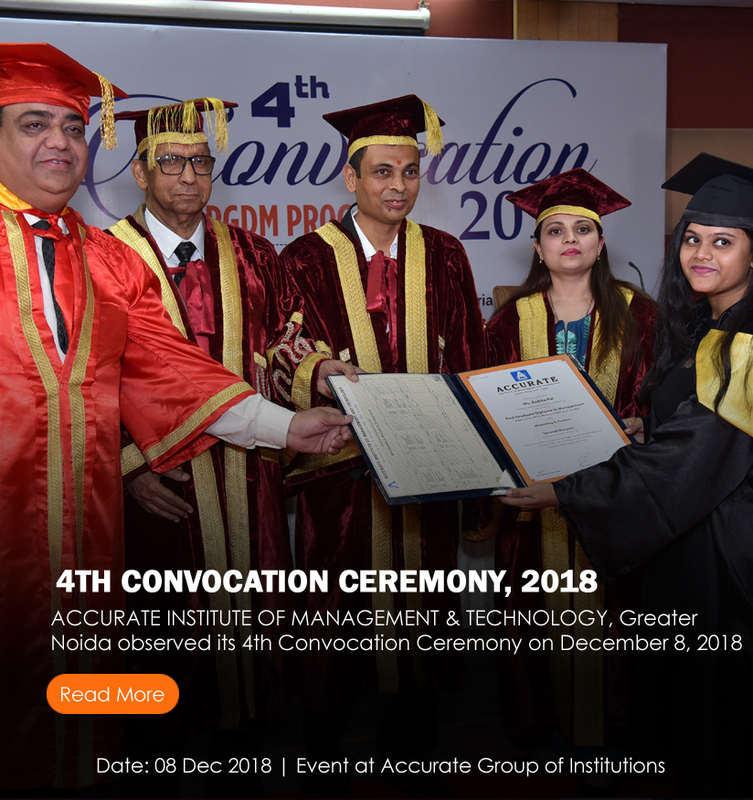 This resulted a good percentage of placements year after year at Accurate Institute of Management and Technology, Greater Noida. The overall placement scenario for Technical as well as Management freshers in 2013 passout batch was good at Accurate Institute. We have successfully achieved 100% mark in MBA/PGDM/MCA and B.Tech. For 2014 passout batch total 430 students out of 875 students have been placed till date across the courses. IBM, HCL TECHNOLOGIES, MICROSOFT INDIA, CAPITAL IQ, LAURUS INFOSYSTEMS, COMPRO TECHNOLOGIES, SAFENET, INTER GLOBE TECHNOLOGIES, TVS, NIIT TECH, GENPACT, INOXAPPS, FORESIGHT, DATA64, GRAPECITY, CADENCE and many more….. the list exhausted to 400 numbers. Apart from this our students are always eager to participate into various Industry Quizzes, the partial list is mentioned below: Industry Oriented Corporate Programs @ Accurate: To meet the challenges of change, we have taken following steps:  Microsoft Programs at Accurate: - Faculty/Students Summer School Program/Window Azure/ Microsoft- I Unlock Joy/ Microsoft Students Partner: Microsoft conducted various events/trainings at Accurate. Wipro Mission 10X :- Mission10X certificate programs is a series of workshops offer a unique opportunity to the faculty members and students of the engineering colleges to go beyond their conventional teaching practices and experiment with innovative learning techniques and styles that focus on helping the learners to. The first workshop of the Mission 10X was held on 19th July 2012 at College campus here where many faculties of the institute and other technical institutes along with students had participated. Google I/O:- Google I/O is an annual developer-focused conference held by Google in Noida where many students of Accurate had participated. Google I/O features highly technical, in-depth sessions focused on building web, mobile, and enterprise applications with Google and open web technologies such as Android, Chrome, Chrome OS, Google APIs, Google Web Toolkit, App Engine, and more. Google I/O was started in 2008. The "I" and "O" stand for input/output, and "Innovation in the Open". The format of the event is similar to that of the Google Developer Day. Mahindra & Mahindra AQ2012 Auto Quiz for Mechanical Engineers: - The idea of the quiz is to allow the young engineering students a chance to interact with experts in the auto field and to create the thrill and excitement about the challenging, exciting and exhilarating world of automobiles. IBM The Great Mind Challenge: - TGMC is an innovative program aimed to encourage students from Accurate Institute of Management and Technology in their endeavor to develop solutions for real-time problems and scenarios using IBM & Open Source Software. It is India’s largest student technology contest, two years running in the Limca Book of Records! L&T Co-Creating Sustainable Solution for the Future: - A competition for students in India & Denmark is a global platform for communication and innovation. It seeks to change the international debate about and involve the citizens in sustainable development. NTPC Electron Quiz-2012:- NTPC has been organizing the “Electron Quiz” for the past five years. In the year 2012 students of Accurate Institute participated in the quiz. The biggest challenge we faced is the awareness issue about the Industry and its dynamics; students are lacking necessary skills, required to get a good job. 1. We initially in the start of the semester increased our reach to all the students, addressing them at a single platform. 2. Increased the participation of students into Training and Placement decisions. 3. Reached at the consensus about the training, method of delivery and time frame. We started with a sole motto, “Let Lit the Fire of awareness and self-motivation into the Student’s Community”. According to National Employability Report, “Even though India produces more than five lakh engineers annually, only 17.45% of them are employable for the IT services sector, while a dismal 3.51% are approximately trained to be directly deployed on projects. Further, only 2.68% are employable in IT product companies, which require greater understanding of computer science and algorithms. An economy with a large percent of unemployable qualified candidate is not only inefficient, but socially dangerous. The right training, at one end, and employability assessments acting as feedback at the other, will help both in goal-setting and tracking progress to make a larger proportion of engineers in India employable. This report is indicating towards a panic and an alarming situation for all of us the in the society, this is the phase to take action by all Industry/ Institute/ Students. The corporate have to raise their hands from K12 levels to address the large student community, as this is the time where student’s career gets foundation. Corporate may conduct Road Shows, awareness Camps and some level of elementary training sessions. At the Graduate level this is the utmost responsibility of the respective institute to identify the gap areas among the students when they enter very first year/semester. The extra input is required apart from their curricula. This extra input can be drawn from the industry. The first and the foremost skill required is the Domain Knowledge and 5 Behavioral and Knowledge Skills which students should possess in order to increase their chances of getting a job. 1. Emotional Quotient (EQ) -- More than the intelligence quotient (IQ), it is EQ which employers hunt for in prospective candidates. This is so as high EQ helps individuals build and maintain relations with co-workers and increases level of sensitivity towards others. “People who maintain a calm composure during tense situations can handle situations better and find solutions to problems unlike those who get hyper easily,” Companies look for a EQ: IQ ratio of approximately 80:20 in potential candidates, as they believe IQ can be built, but EQ in often in-built. 2. Communication skills: Students should have a sound ability to communicate with others. Communication is the key in any organization and a good set of inter-personal skills bring about a degree of transparency within the organizational culture. 3. Foreign language proficiency: In an era when 40-50% of the turnovers of all big firms come from international markets, ability to communicate in a foreign language gives a natural edge to a candidate. Fluency in English goes without saying. But command over French, German, Spanish, Japanese or Chinese gives an added advantage. So students can use their free time to enroll in foreign language classes. 4. Digital Savvy: Students need to be savvy about computers and technology. But they should also be gung ho about working in a virtual environment through the telephone, internet, video conferencing etc. Experts say lot of deals and discussions take place through a virtual environment and candidates need to be comfortable and confident about enacting their roles through a virtual set-up, rather than always insisting on a face-to-face meeting. 5. Sensitivity towards different time-zones: Especially true for the IT, ITes, KPO/BPO, Automotive and other sectors where a large chunk of the employee and customer base resides in different time-zones.